* 참가신청 ips@pspd.org로 성명, 소속, 연락처, 심포지엄 소식을 접한 경로를 알려주세요. 모쪼록 이번 국제심포지엄에 참석하시어 자리를 빛내주시기 바랍니다. and Institute for Participatory Society (IPS) to be held on November 5, 2012 in Seoul. Over the past two years, heated debates on how to realize a welfare state in Korea have continued. However, special circumstances of the country as a divided nation have been overlooked within these discussions. welfare and peace, peace and democracy, and democracy and welfare. while heading for peace nation, and thd US facing a dilemma between security and welfare. 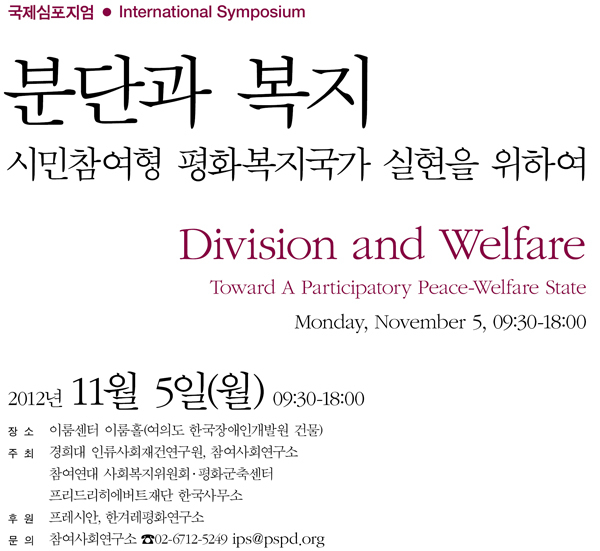 participatory peace-welfare state in Korea. We sincerely invite you to be a part of this symposium.